For our 30th wedding anniversary this year, the only gift I wanted was for the two of us to spend time together, away from everything. Thus we chose to go camping in the back country of Algonquin Provincial Park Thanksgiving weekend. After checking with our adult children that they didn’t mind us going away for Thanksgiving, we left Hamilton at 7:15 am. As we were driving towards Algonquin, my husband decided that we should add an extra day to our trip to avoid the traffic coming home. Once we arrived at Canoe Lake, we then changed our destination from Little Doe Lake to Burnt Island Lake since there were just too many bear warnings for the first area. We are quite prepared with our cans of Bear Spray, plus we keep a clean camp site and make sure our food is always in a barrel tied high up in the trees. (The one exception is my cream, which is in a thermos, in a thermal bag, tied in the water). Food barrel tied high in trees. Matt and I ready to embark. We left Canoe Lake at 12:30 p.m., arriving at the first of four portages at 1:45 p.m. Our itinerary went as follows: Canoe Lake to first portage to Joe Lake, then Joe Lake to the East Arm, then to Joe Lake; we avoided the second portage into Lost Joe Lake since the water was high enough to paddle through the river; the next portage was from Lost Joe Lake to Baby Joe Lake, where I proceeded to fall trying to get back into the canoe (the lake was not deep enough for us to sit in and paddle, I walked well hubby pulled the canoe through the river); soaking wet from the waist down and with sore knees since I fell onto rocks, we headed towards the portage to Burnt Island Lake, at this point we had to do the portage since there is a dam between the two lakes. Once in Burnt Island Lake we found a campsite around 5:15 pm. We had spent approximately five hours in the water. Day two: We awoke around 7 a.m. with a drizzle of rain. Erect second tarp beside the tent, so we do not get wet from the rain. Our daily was spent lazily by the fire playing scrabble and cribbage. There was quite a violent rain and wind storm Saturday night, apparently the remnant of Hurricane Nate. The tarp over our tent did an excellent job of keeping our tent dry. Once the tarp would fill with water, it poured off each side. Around 5 a.m., there was one last huge wind gust that made one of our ropes snap, but this was easily fixed. Another day of relaxation, until I picked up the bear spray and accidentally sprayed myself in the eye. I had neglected to put the safety back on the can after going to the toilet. It sprayed forward, but then there was a back-wind. Thankfully we always have a jug of water on hand, so Matt quickly jumped up with the water, and flushed my left eye. The rest of the day was again spent just relaxing and enjoying the view and silence. Day three: Was shorts and t-shirts. We did some fishing and took lots of pictures. In the afternoon we went for a canoe ride, where I became so involved with picture-taking I didn’t realized I was moving back in my seat, only to fall backwards into the canoe. It hurt, and I couldn’t right myself back into the seat. Matt paddled back to the campsite so he could remove me from the canoe. (I tend to be the comic relief). Laying down in the canoe because I fell backwards. Please ignore the rat’s nest of a hairdo I have. Day four: Monday, another day of tuning out and enjoying nature. Day five: We packed up our campsite and started the paddle back home. This entry was posted in adventure, Algonquin, Algonquin Provincial Park, Anniversary, Autumn, Autumn Leaves, backcountry, Backcountry Camping, bear spray, Burnt Island Lake, Camp, Camping, campsite, Canada, Canadian Thanksgiving, canoe, Canoe Lake, Canoeing, Canoes, Ducks, Fishing, Hamilton Ontario Canada, Loon, Ontario Parks, Portage, Red breasted Merganser, Sunset, Wedding anniversary and tagged Algonquin Algonquin Provincial Park Anniversary Autumn Backcountry, Baby Joe Lake, Barrel, Bear Spray, Bear Warnings, Burnt Island Lake, Camp, Camping, Campsite, Canoe, Canoe Lake, Canoeing, Ducks, East Arm, Loon, Lost Joe Lake, nature, portage, Present, Red Merganser, Sunrise, Sunset, Thanksgiving, Thermal bag, Travel, vacation, wedding anniversary on October 22, 2017 by AlwaysARedhead. Cocoa is with the teenage boy and I, Bear is with middle child and my husband. On Sunday I had this wonderful idea that we would all go canoeing and this time we would bring our dogs with us. Now Cocoa who is over nine years old, weighs around fifty pounds, loves to swim (hates baths, must be the clean water) but has never been in our canoe before. Bear, middle child’s dog is two years old and weighs about eighty pounds has also never been in a canoe. 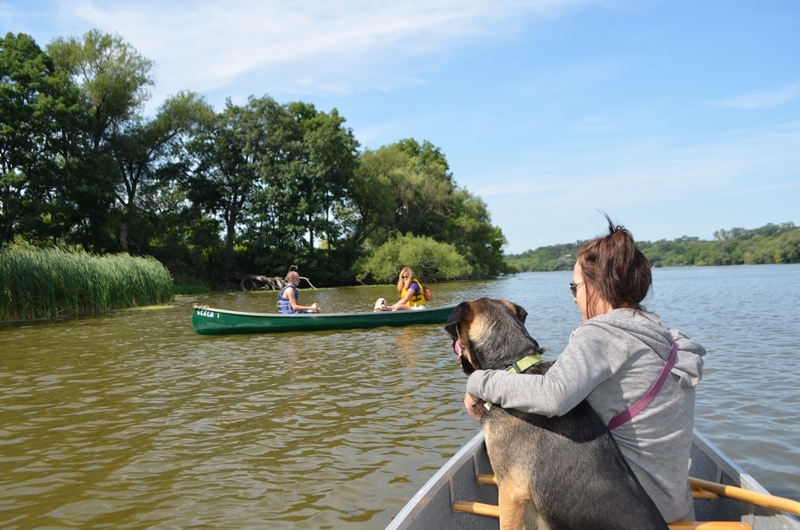 At first we thought it would be best to have one dog in each canoe because of their weight. Just before we headed further out onto the water, Bear actually jumped out of the canoe he was in, then proceeded to jump back in, how he didn’t topple everyone was very surprisingly. 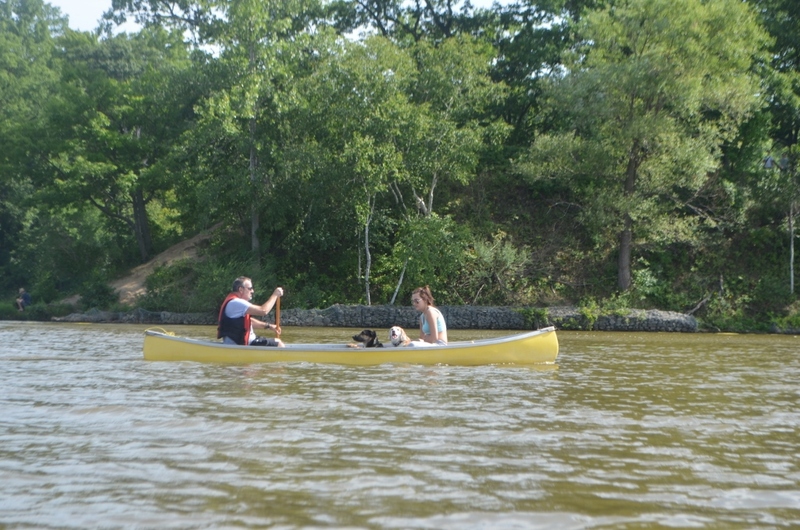 As we started to paddle, Cocoa was not at all happy being in a canoe without Bear, my husband and middle child, who spoils both dogs. So there we were trying to keep the two canoes aligned so Cocoa could jump from one to the other. Again, how we didn’t topple from the weight of the dogs. Cocoa finally stopped barking but was not completely sure about this canoeing thing, Bear on the other hand, just seemed to stand and look around. 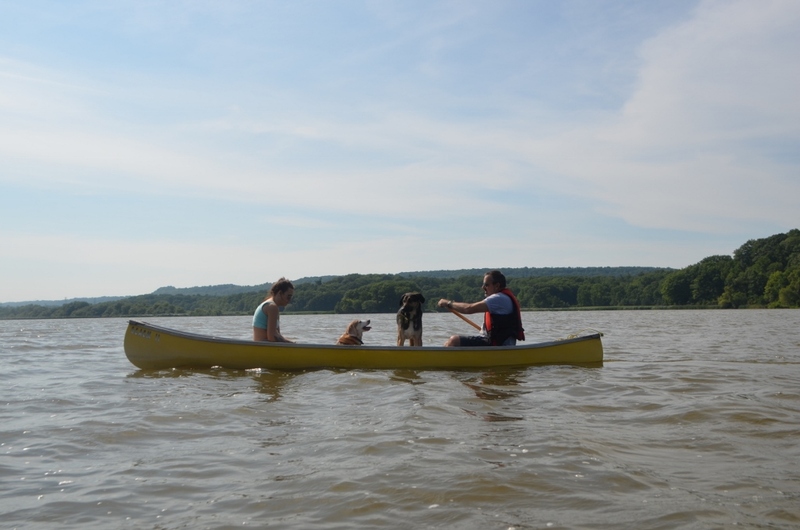 With the added weight of both dogs, my husband did find it difficult to paddle, middle child could not give him a hand because they were unsure if Cocoa would jump out, so she basically had to hold him for most of the ride. 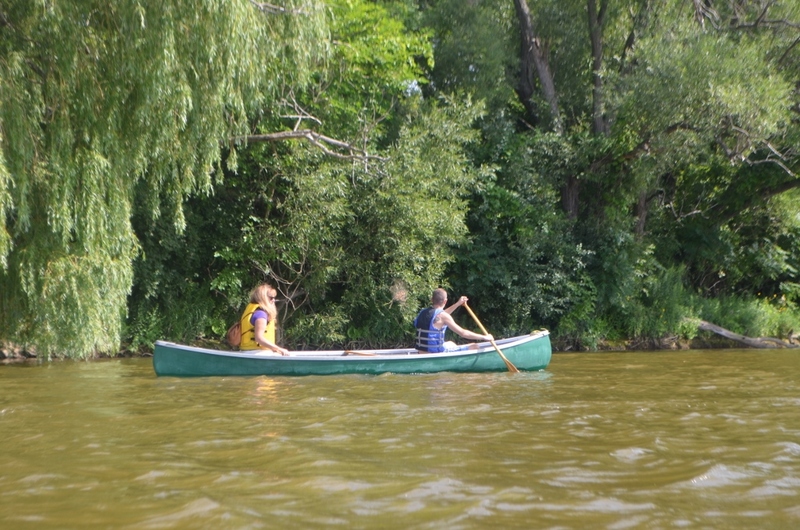 After a while the dogs did calm down and we were able to have a lovely afternoon of canoeing. The even nicer thing about Princess Point, it is only a fifteen minute drive from home. Bear standing in the canoe, and with his shifting weight, made it difficult at times to paddle. The teenage boy and I. The teenage boy and I further out on the water at Princess Point, fifteen minutes from home. Both dogs finally sitting in the canoe. The eldest was in charge of snapping pictures. You can just see the name Belugavieve (her nickname) on her kayak. 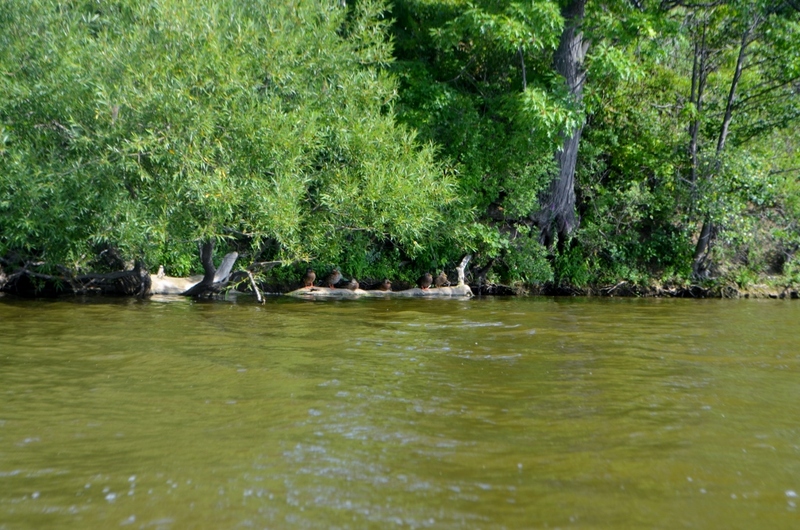 Seven ducks all lined up on a log near the shore. 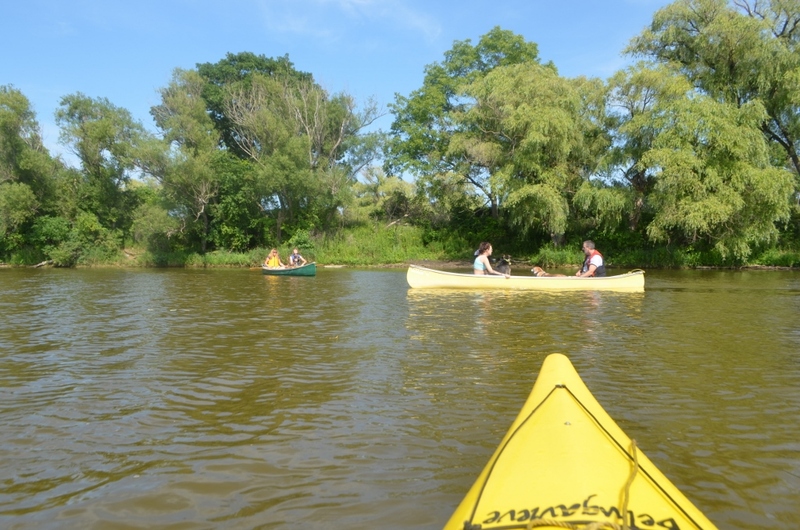 Princess Point is a gem in Hamilton, Ontario and on Sunday there were many paddlers out on the water. 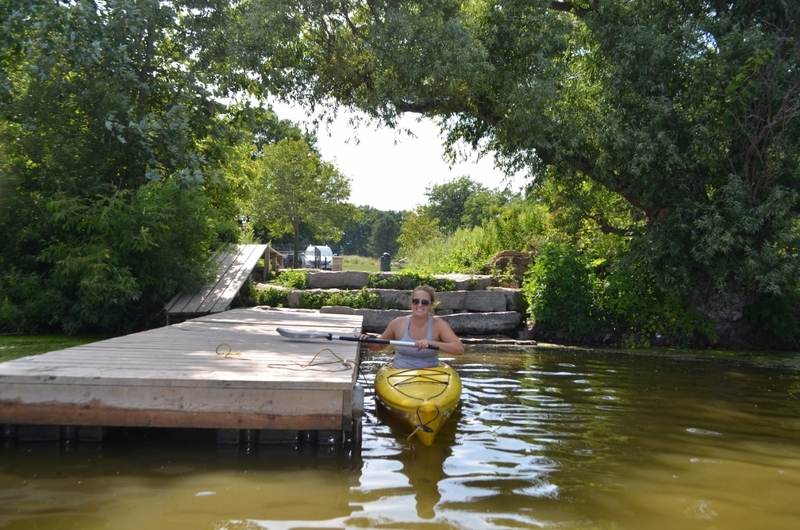 This entry was posted in Beagles, Canada, canoe, Canoeing, Canoes, Doberman Shepherd mix, dogs, Dogs in canoe, Family, Family, Hamilton, Hamilton, Kayak and tagged Princess Point, Princess Point on August 12, 2014 by AlwaysARedhead.